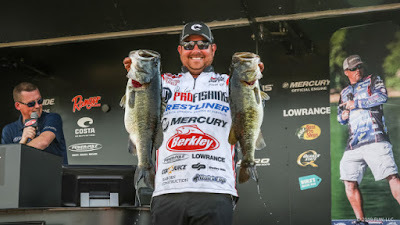 IBASSIN: 2019 FLW Tour Lake Toho Day 1: John Cox Lands Mega Limit of 31-09bs! 2019 FLW Tour Lake Toho Day 1: John Cox Lands Mega Limit of 31-09bs! John Cox a sight fishing master shows how it is done! Day one of the FLW Tour event presented by Ranger Boats on Lake Toho looked like a slugfest if there ever was one, and it kind of was, but kind of wasn’t. John Cox leads with 31 pounds, 9 ounces. John Voyles and Scott Martin each weighed in 24-plus, and everyone in the top nine weighed at least 21 pounds. The weights are impressive, but no one really hammered giants all day long, and there just weren’t as many big girls spawning as most pros anticipated in the middle of an extended warming trend. So while it looks like it was a heck of a day, a lot of pros are wondering why it wasn’t just a little bit better. They’re also wondering what to do tomorrow. At least a handful of the 20-plus-pound performers are considering changing lakes on day two – evidence of their uncertainty, but also a testament to the overall quality of the lakes on this chain. Cox, who had an early boat draw, was able to run straight to some bedding fish he had marked from practice and enjoyed a record-setting day that included the biggest limit ever weighed in an FLW Tour event here on Toho. The sight-fishing expert caught an 8-pound-class fish early in the morning and then chipped away here and there with smaller fish. Yet by midmorning, he was feeling a little befuddled. That “big one” was a 10-pound, 9-ounce bass that is the third largest ever weighed in a Tour event here on Toho. He caught that fish by winding a Berkley PowerBait Wind Up worm with a light tungsten weight. Eventually, Cox improved with a couple more culls, including another fish on the Wind Up to go with three in his final limit that were caught sight-fishing. He fished about 30 spots and had to deal with a lot of pressure from other anglers who also sniffed out the best sight-fishing waters. Cox plans to start the day Friday checking some clear bedding areas, but then he’s willing go wherever he needs to go to find a few more big bites and try to extend his 6-pound, 10-ounce lead. Because despite putting up the best performance in Tour history on this fishery, Cox is going to need to continue to parade in with giants if he wants to stay on top here in Florida. Indiana pro John Voyles says his history here in Florida is nothing to brag about. That changes after today. Voyles can do a lot of boasting about the 24-pound, 15-ounce limit he sacked up down in Kissimmee. Voyles got his morning started off with a nice break. As boat 65, he figured he’d not be able to get into the lock out of Toho without a long wait. It was a nice surprise when he arrived to see only 10 boats waiting (the lock holds about 15). He got right in, right out and raced on to the big lower lake. Voyles tried to relocate some shallow fish, but figures they were either caught already or had backed out, because they were gone. A deeper stretch really saved his day. Voyles caught the four little ones there early, then came back later and went to work. He caught several nice keepers and culled four or five times before catching an 8-5 off a waypoint where he also shook off a real big one in practice. He came back to the spot again later and caught another fish in the 8-pound-class. Voyles is chucking reaction baits. His strategy is not really based on a pattern, but hinges on a key area that he’s sharing with a handful of other boats. Scott Martin almost always has the biggest fan base at FLW Tour events. Today, he gave his fans a real show at weigh-in. The Florida native weighed in a whopping 24-pound, 12-ounce limit that included two fish in the 8- to 9-pound range. Martin’s day started off with a lot of fish, but not a lot of size. He had a limit early for about 7 pounds. Then his day really picked up thanks to smart timing. Having a kicker in the box really let Martin settle down, he says. He worked into a good area and eventually hooked up with his other big one. Martin says he’s pitching for most of his fish. He’s happy with what he had today but thinks this tournament is still wide open because the fish aren’t doing exactly what most pros expected. Austin Wilson’s grin at weigh-in stretched as far as his journey to get here. The 2018 The Bass Federation National Championship winner from California pounded 21 pounds, 11 ounces on day one and is hoping to make his second consecutive top-30 cut to start off his rookie campaign. Wilson had about 11 pounds in his livewell by 10 a.m., including a 5-pound kicker, before his day really took off. Fishing a spot where he’d caught a 6 and a 4 on the second day of practice, Wilson got a bite on his worm from what he was pretty sure was a spawning bass. He missed the fish and, wanting to throw back with something he could fish down deep a little easier, Wilson picked up a ChatterBait because it was the only heavy bait he had on his deck. He fished the vibrating jig like a regular jig and got her to bite again. The fish turned out to be a 9-pounder. Wilson is working through two decent-sized areas, but he’s spending a lot of time really thoroughly picking them apart with a worm and the ChatterBait. He believes most of his fish were spawning, and you can bet he’ll have a regular old jig rigged up for tomorrow. David Dudley was one of the first pros to weigh in, and he set the Big Bass bar early with an 8-pound, 10-ounce bass. His approach on Toho today probably included the most variety among the top 10 pros. “It was a grind, really,” Dudley says. “I caught one here, one there. I got lucky with the big one. I caught them on everything from swimbaits to drop-shots to flipping to a wacky worm. The Virginia pro is fishing Toho and Kissimmee, where he’s catching both prespawn and spawning bass. Scott Martin says Lake Toho has been dropping ever since practice started. He thinks the falling water might have something to do with why pros didn’t see quite as many big girls on beds up shallow today. Otherwise, conditions seemed perfect to really have a banner day. The water temperature has climbed into the mid-60s, and the weather is stable and warm. It really should have been gangbusters for everyone in the field, yet many pros struggled to find anything better than 2-pound fish throughout the first half of the day. The water level might be a story line to follow, as will the rain and wind in the forecast for the weekend. Throughout the life of the day one coverage blog at FLWFishing.com, it seemed like pros were either catching 8-pounders or 2-pounders. There weren’t a lot of those in-between quality bites being reported. At weigh-in, we got to see just how many of those upper-end giants were landed. Marty Mann, a fisheries biologist in the region, was on site keeping track of 8-plus-pound fish for the Florida TrophyCatch program. He says there were 11 bass over 8 pounds weighed in for Big Bass. Three of them weighed more than 9 pounds, and one of them – John Cox’s kicker – weighed more than 10. We also know that Cox, John Voyles and Scott Martin each had a second 8-pound-class fish in their catch that didn’t get weighed individually. That’s some hawgs. Mann says the data from the program helps biologists study the health of the local fisheries and look for trends in the quality of the fish caught from each lake in the chain. It’s also a valuable marketing tool to attract out-of-town anglers. The program offers prizes to anglers who catch, document and release bass that weigh more than 8 pounds. Read more about TrophyCatch. One of the TrophyCatch fish caught today was extra special. David Dudley’s 8-pound, 10-ounce fish was tagged by the Florida Fish and Wildlife Conservation Commission as part of a big-bass exploitation study. By submitting the tag, Dudley will get a reward of $100. At least three pros in the top 10 reported seeing bass in the 10- to 12-pound class on beds during practice and day one of the tournament. Those real giants seem to be near impossible to catch, and they don’t stick around for long. Keep your fingers crossed that we’ll see another 10-plus sometime this week. Though several of the biggest limits came from Lake Toho today, more anglers fished Kissimmee, and the general opinion shared by the top 10 is that Kissimmee has the goods to produce for four days in a row. Expect to see many of the top 10 fishing there on FLW Live this weekend unless another wave of giants moves into the clear shallows on Toho where pros can sight-fish them off beds.